‘Nothing has allayed the concerns’ of copyright-watchers on the world stage, according to Copyright Clearance Center’s Michael Healy. As spring begins, Michael Healy, executive director for international relations with Copyright Clearance Center (CCC), offers us his expertise on the world key copyright issues and concerns. CCC programmed several seminars on copyright at this year’s London Book Fair and was one of the backers of the Charles Clark Memorial Lecture this year on the Fair Use doctrine. CCC was also a key sponsor with Ixxus of London’s Quantum Conference. As Healy has stressed in recent commentary and appearances, an age in which freedom of expression is challenged frequently means mounting concerns for copyright issues in many parts of the world. 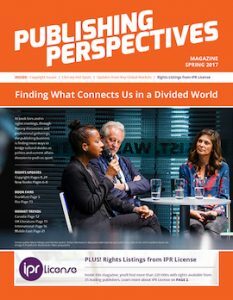 Publishing Perspectives: Considering the difficulties you’ve outlined for us in recent months, how do things look in copyright in 2017? The outlook overall remains very precarious for rights-holders of all kinds and I see no signs of that changing any time soon. Whether it’s a new government review of copyright, new legislation, or a hostile judicial decision, there’s no shortage of worrying signals wherever you choose to look–from Australia to India, from South Africa to Brazil. PP: Are there new hot spots of copyright concern opening up in parts of the world we need to be aware of? MH: I think everyone is watching with close interest what will happen next in Australia. The government there asked the Productivity Commission to conduct a 12-month inquiry into the country’s IP system and the commission published its final report on December 20. Australian rightsholders have been appalled by many of its proposals, including one to introduce a new copyright exception based on the US Fair Use model. They’ve been very well organized in their opposition to the report, so it remains to be seen how the government—which has promised a response by mid-2017—reacts to the outcry. India is another hot spot worth watching. The long-running lawsuit between Delhi University and several publishers took a bad turn in December when the High Court ruled against the publishers, and we wait to see how they will react. Appeal to the Supreme Court or abandon the case? Either response opens up a further period of uncertainty for rightsholders in India. There are other countries–Brazil and South Africa, for example–where there’s considerable uncertainty about what happens next with copyright and with anticipated changes to it, and no doubt rightsholders will be watching such places very closely. PP: And then there are the European Commission’s proposals as part of the Digital Single Market initiatives. How do you assess these moves? MH: The program to modernize the EU’s copyright framework is an enormous, continuing project. Something of this magnitude and ambition is inevitably going to be divisive and, in some instances, very controversial. Parts of the reform have a populist appeal, notably the recent agreement that will eventually allow consumers to use their online subscriptions across national borders when they travel within the EU. Others are more specialized. Take, for example, the Orphan Works Directive and the Collective Rights Management Directive. It’s impossible to generalize about a program of this scope, but it’s fair to say that publishers, faced with the EU’s agenda, are looking for it to achieve the same balance that they want all around the world, namely a proper recognition of the contribution made by copyright to the overall creative economy and of the part publishers and rightsholders play, not just to that modern economy, but to education, scholarship, and culture. PP: Can we forecast as yet any special copyright situations that may arise in the UK as a result of the Brexit referendum? MH: I think it’s too early to tell, although opinions on the subject among legal experts vary a great deal. The big uncertainty, of course, is the terms under which the UK negotiates its exit from the EU. We know so little about that yet and the precise shape of Brexit will become known only gradually over the next couple of years. What treaties will the UK negotiate as it walks out the door? No one knows yet. It perhaps ought to be assumed that the UK government will do everything it can to minimize disruption to its overall legal framework, but even that is pure speculation at this stage. PP: On the whole, are we a better educated publishing industry in 2017 on copyright than we’ve been in the past? MH: I believe levels of awareness and levels of concern are growing throughout the publishing industry and around the world. After all, copyright is front-page news. Turning that awareness and concern into organized opposition is a different matter, of course. We know from experience in countries such as Canada that it’s possible to wake up too late and to find that conditions we thought were secure have been damaged severely and are probably irretrievable. This is where trade associations have an important part to play: spotting the signs early, raising awareness, galvanizing industry, organizing effective campaigns, and educating communities of the value of copyright. PP: The world’s a big place, but in the long view, how ready does the international publishing community appear to be to tackle some of the most pressing copyright issues highlighted today? MH: It’s unfair and dangerous to generalize. I can think of so many publishers taking prominent and creative roles in the fight to protect copyright–combating infringement, contributing to industry campaigns, and embracing creative licensing solutions. The same is true of many trade associations around the world, whether it’s international ones such as the IPA and IFRRO, or more nationally-focused ones such as the Authors Guild in the US, with which Copyright Clearance Center has been working closely in recent months on copyright education programs. Should more companies be more involved? Yes.